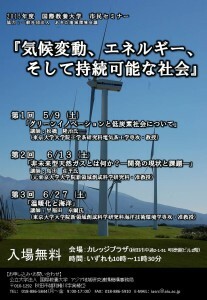 Akita International University (AIU) has been organizing a lecture course entitled “Climate Change and Society” since 2009 in collaboration with the University of Tokyo. AIU will be offering series of three lectures as an open lecture of this course. Faculty members of the University of Tokyo will be giving lectures in Japanese. You will be able to learn issues of global warming and other environment problems as well as foremost research findings. You can attend only some sessions of your interest. 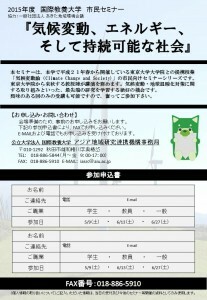 We welcome many people to participate in this course. Please sign up in advance by phone, fax, or e-mail.